Even before driving age, my friends and I somehow found a rusted old Czech Jawa WW-II era motorcycle. Having no real mechanical skill we could never get it to start up, but we had fun pretending. I saved all my grass cutting money until I had ~$400 to buy a brand new Yamaha 80cc 2-stroke when I was 15. You could ride MCs back then with a learners permit - no lessons required. And my parents ALLOWED me. How crazy is that? 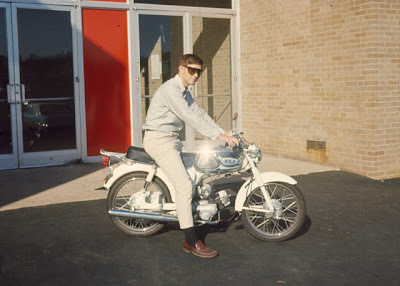 Rod on his new Yamaha 80 (1966 YG-1). Where's the Helmet? 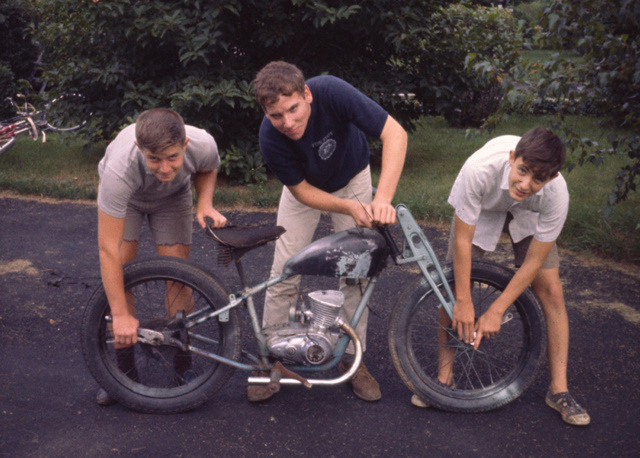 I rode it to high school and commuted to my summer job at Fabri-Tek in Ft. Washington, PA. I eventually bought a helmet.